We at Austin City Limits were saddened to learn of the death of country pop great Glen Campbell at age 81. The Arkansas native began his career as a first-call session guitarist in Los Angeles, playing as part of the infamous Wrecking Crew and adding licks to a staggering array of hits records: the Righteous Brothers’ “You’ve Lost That Lovin’ Feeling,” the Byrds’ “Mr. Tambourine Man,” Elvis Presley’s “Viva Las Vegas,” Merle Haggard’s “Mama Tried,” and singles by everyone from Jan & Dean and the Monkees to Frank Sinatra and Nat “King” Cole. In 1964, he subbed for the Beach Boys’ Brian Wilson on tour and in 1967 sang uncredited lead vocals for the cult sunshine pop group Sagittarius. 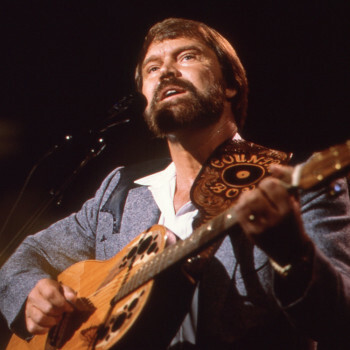 Campbell scored his first solo hit on the country charts in 1966 with “Burning Bridges,” but it was in 1967 that he became a household name with “Gentle On My Mind.” He followed that with even bigger hits, forging a special bond with songwriter Jimmy Webb via “By the Time I Get to Phoenix,” “Galveston,” “Where’s the Playground Susie” and “Wichita Lineman,” which became his signature song. He parlayed his musical stardom into a major acting gig in the 1969 John Wayne vehicle True Grit, for which he also performed the title tune, and the host job on the popular TV show The Glen Campbell Goodtime Hour from 1969-1972. Refocusing on music, Campbell earned some of his biggest hits in the 1970s, including the #1 pop smashes “Rhinestone Cowboy” and “Southern Nights” and the top 20 hit “Country Boy (You Got Your Feet in L.A.).” While his pop stardom faded, he remained a major force on the country charts for years, also expanding into gospel and Christian music. In 2008, he released Meet Glen Campbell, an album featuring covers of songs by Tom Petty & the Heartbreakers, the Replacements, Green Day and the Foo Fighters. His 2010 follow-up Ghost On the Canvas followed a similar vein, and was intended as a farewell LP. But his 2011 diagnosis with Alzheimer’s disease led him to one final album (Adios, recorded in 2012-13 but released in 2017), a farewell tour and a documentary, 2014’s award-winning Glen Campbell: I’ll Be Me. His final recording, “I’m Not Gonna Miss You,” was released in 2014, by which time he was living in a Nashville memory care facility. He died in Nashville on August 8, 2017.